modelrailways.co.uk was created by a keen modeller who had never found an online community that he felt catered for his specific needs and interests and being no stranger to web-based companies, he decided the best way to achieve what he wanted was to create a new online community from scratch. The original aim for modelrailways.co.uk was clear, the site was to create a platform for reviewing model railway products and to build an online community suited to all members of the hobby whether they are a casual hobbiest, on the exhibition circuit or even those who just want a “train set” to play with. After a short time it was realised that there was a gap for a, not only cheap but, reliable and customer friendly online retailer for model railway products.The aim of the site then evolved to include an online retail store for both mainstream and smaller model railway suppliers with the key focus being on customer service and maintaining a community of modellers and advice where all could feel welcome. The result is the modelrailways.co.uk website you see today and although the store has only been running since October 2010 there is already a growing online community of enthusiastic, but more importantly friendly, modellers who are keen to give advice and support on many different aspects of the hobby. You will not see any “locals” propping up the counter here (metaphorically that is! ), but what we hope you do find is a group of open-minded modellers who will gladly exchange their own advice for yours! Another element added in the redesign was the modelrailways.co.uk blog, home to our two resident experts Bill and Brian who will endeavour to answer both your real and model railway questions and offer free advice and inspiration to all. 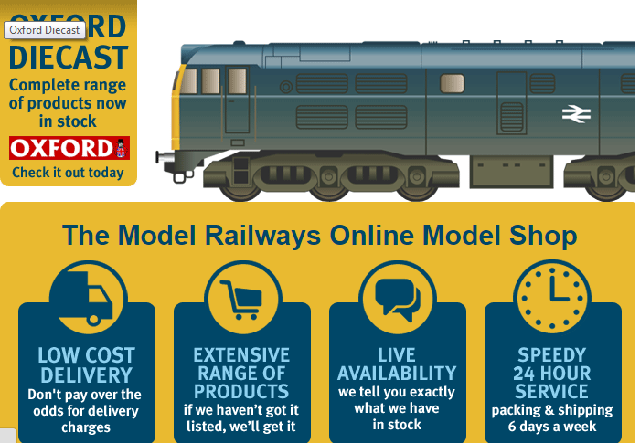 There is an ever growing catalogue of modelling products available through the modelrailways.co.uk store and although we are constantly looking for new products and ranges to compliment the store, please let us know if you feel we are missing a range you would like us to stock or if you have any feedback and suggestions for the site.